Have a question? Submit your inquiry through our Contact Us webpage. We’ll return your e-mail as soon as possible, typically within one business day. How can I be sure that my credit card transaction was secure? By law, we collect sales tax on orders that ship to addresses in New York state. For more information, please visit the New York State Department of Tax and Finance website here. Do you process corporate gift and/or custom orders? Whether you’re looking to place a large order for any of the items in our online store, or seeking a custom assortment for your corporate gift needs, we are happy to work with you. 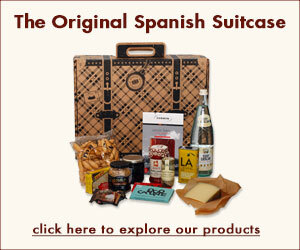 To initiate this type of order, please contact us at sales@spanishsuitcase.com. To ensure that your seafood, ham, cheese and chocolate products stay as fresh as possible, please follow our storage recommendations. Seafood: Seafood conservas – jarred or canned – should be refrigerated after opening. Ham: Store ham in refrigerator upon receipt. Cheese: All cheese must be refrigerated upon receipt. We recommend storing your cheese in the vegetable drawer, which is slightly warmer and more moist. For best results, be sure to keep your cheese in the special wrapping paper that it arrived in with your shipment. Chocolate: All chocolate bars and products with chocolate as an ingredient should be stored in a cool, dry place. I found white spots on my jamon ibérico. Is this normal? The chalky white flecks and lines that you may notice on the surface of your ham are produced by the crystallization of thyroxine, an amino acid that naturally forms in meats and cheese which have been properly cured and matured. They are perfectly safe to eat. I’d like to recommend a product for inclusion on your website. How can I reach you? I savored every bite of my purchase. How can I share this scrumptious news with you? We love hearing from our customers. If you enjoyed your Spanish Suitcase purchase, we encourage you to post comments and photos to the Spanish Suitcase Facebook page, or tweet about your purchase to @SpanishSuitcase. Or, e-mail us with your testimonial at customerservice@spanishsuitcase.com.